"Trade with the USSR Requires Ingenuity, Patience and Persistence." Trade with the USSR requires ingenuity, patience and persistence." Such is the opinion of a prominent US businessman, Moreton Binn, who has recently returned from one of numerous trips to the Soviet Union. Binn is CEO and president of the multinational corporation, Atwood Richards Inc., the world's oldest and one of the largest firms specializing in barter trade. "Contrary to common misunderstanding, barter - the exchange of one commodity for another - is successfully used in developed economies of the Western world," said Binn, speaking on Wednesday, December 19th, at a news conference at the New York Center for Foreign Press, sponsored by the US Information Agency (USIA). "Witness the fact that Atwood Richards has Exxon and Amoco, major firms with worldwide reputations in the oil and chemical industries as clients, as well as US Steel (USX). Some of our European clients include the German sporting goods companies, Puma and Adidas, as well as Vergolst, a subsidiary of Continental Tire; in France, Damart, a major clothing manufacturer: fine crystal from Daum and mopeds from Peugeot. Other European clients include Peter England, shirt manufacturer in the UK, a division of Carrington Viyella Garments, Ltd.; Orsini, the parent company of Ermenegildo Zegna, a high-end men's fashion designer, and Chupa-Chups, confectioners in Spain." According to Binn, his firm acts as an "emergency rescue service" of sorts for companies experiencing short-term difficulties in marketing their merchandise. "For instance, right now the weather is unusually warm in the Eastern United States for this time of the year, and the firms dealing in winter clothing are having a difficult time simply because they do not have back-up distribution channels. With Atwood's intervention, the winter clothes are remarketed to Scandinavian countries and the USSR, where the clothing could be sold at a reasonable price," he explains. "In its turn, Scandinavia, perhaps, experiences a glut of lumber, which after an acceptable discount could be successfully marketed in Africa in exchange for bananas, to give you another example." Recently, Atwood Richards has been paying special attention to the countries of Eastern Europe. The firm's experience in setting up barter trade has become especially valuable under the conditions where hard currency is in short supply. New offices have already been opened in Czechoslovakia, Hungary, Poland and the Soviet Union. Bulgaria and Hong Kong will be next on the agenda. Binn, the US chief in charge of worldwide barter trade. 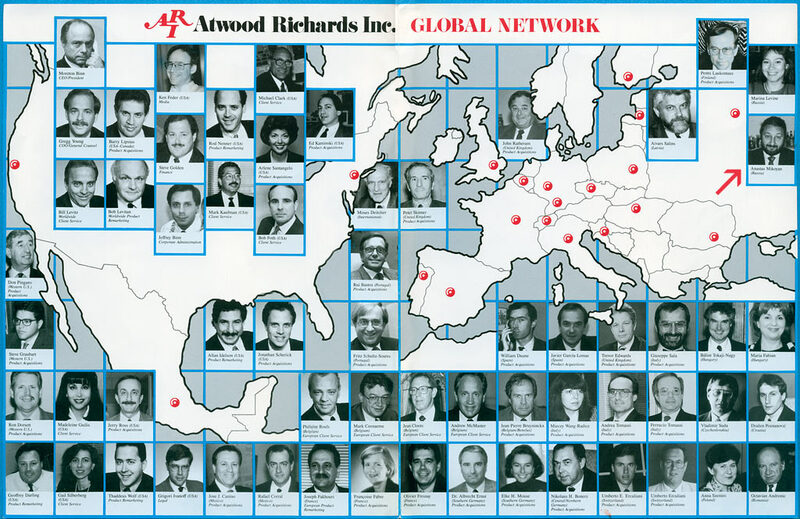 Until recently trade operations involving the Soviet Union have been transacted by Atwood Richards through its business partner in Finland. Sensing a need for more direct contact, Atwood established a joint venture, Stanbet, an organization run by Anastas Mikoyan. According to this new agreement, the functions of a trading partner in the USSR will be assumed by Atwood Richards/ Stanbet. It was set up with the active participation of Mikoyan, better known among the Soviet pop-music fans as Stas Namin. "This time music has no relation to business," said Namin in the interview with the TASS correspondent. "I have simply decided to try to find ways to apply my business skills acquired in the course of running operations of the music center."